In “Manuscript Found in a Bottle”, Poe tells the story of a man sailing on a boat with his crew and the captain. There is a terrible storm and their boat is suddenly flushed with water, leaving the narrator and only one other man as the only survivors. 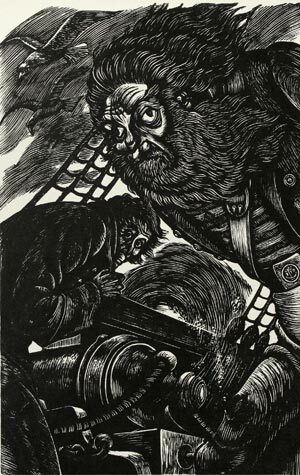 Somehow the narrator makes his way aboard another ship, and he then recounts his strange tale of the men he encounters there. I was actually a bit disappointed with this short story, to be honest. It didn’t seem like very much happened as far as plot goes, and it dragged quite a bit in the beginning. The concept of the story itself might have been more unique at the time of its publication, but it’s so overused now: a horrible shipwreck in a strange storm. The ending was stereotypical and predictable (SPOILER: the ship gets sucked into a vortex in the middle of yet another storm) and the narrator was nothing special, really. However, I did like how the “manuscript” was actually the short story itself being written by the narrator while he was aboard the other ship, and Poe’s writing was excellent, as always. Overall, this definitely isn’t one of best of Poe’s short stories that I’ve read thus far in Poevember. I would recommend it for those who are really into Poe, but otherwise he has written plenty of other better stories that you would probably enjoy more than this one.